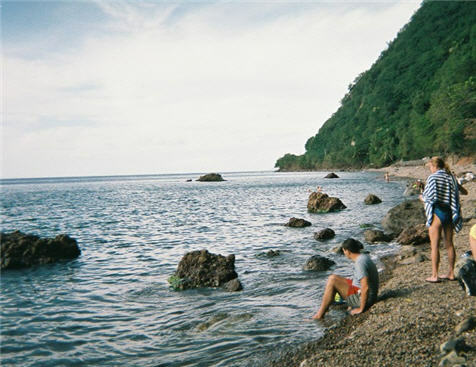 We were supposed to go kayaking in Dominica but we cancelled because I have a bad back and was afraid to aggravate it. But we met later on people coming back from that tour and they loved it and said it was well worthed. Instead we just got out and walk the streets and took pictures. It was very hot. This was our 3rd time on the island and had seen all the popular spots. But I had made previous arrangements to meet Levi, our guide from last year. I have been in contact with him because I'm helping him redo his website. So we found him around 1pm and since he had no other tours that day, he offered to take us snorkeling at "champagne reef". It's only a 15-minute drive from the pier. There is an entrance fee of $2.00US each and they also rent snorkeling equipment but we had our own. We walked on a wooden bridge over the rocks as there is no sand on the beach. The scenery is quite unique: you look up at green cliffs on the left and the ocean on the right. Levi took us to the end of this rocky beach and we got in and started snorkeling thru these bubbles just like if you wer in a champagne bottle! it was very interesting. Then he guided us further away along the cliffs and it was great, lots of fish and different rocky formations in the water. We stayed for about an hour. Loved it! We are now sailing towards St Thomas.